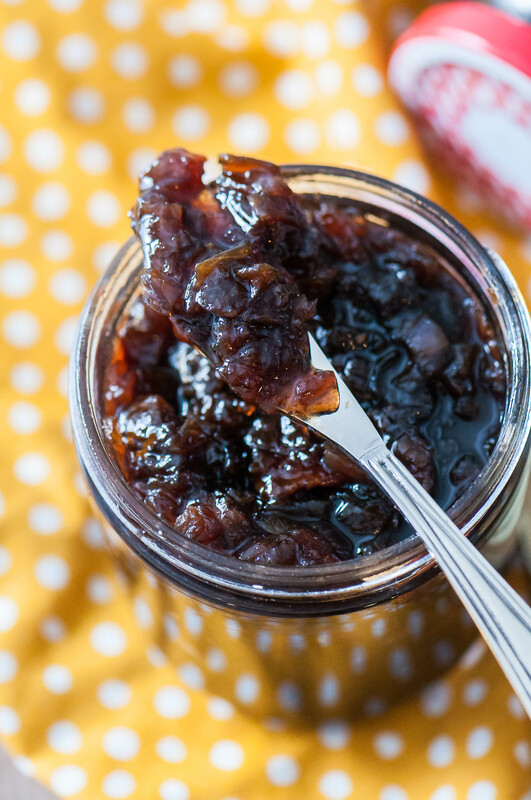 Bacon Onion Jam is a delicious, sweet and savory condiment that is going to blow your mind. Smoky bacon, red onions, sugar and vinegar are cooked down to create a thick, caramelized jam that is delicious on crackers, sandwiches, brie and more. I know we’re only halfway through January but I’m ready for Spring. It’s been a bitterly cold winter here and I’m over it. Although today is supposed to hit 50 degrees so we’re going to enjoy it to the fullest. Yes, 50 degrees when we literally were just iced in for days. Luckily, the storm wasn’t as bad as they had predicted and the temperature rose enough to clear the roads by yesterday afternoon. We broke out of the house so I could work out and get a little reprieve from my lovely but sometimes obnoxious children. I love them but 2 1/2 days in the house is too much for all of us. If you follow my Instagram stories, you saw some of the fun we had, some photos/videos of the ice (and the process of making this jam). So now I’ve been through an ice storm and I’m good. No more. Ok, thanks. Let’s talk about happier things. Food. I am so excited to share this Bacon Onion Jam with you guys today. I know it doesn’t look super appetizing and maybe it sounds weird but trust me, it is so so good. Have you ever tried onion jam before? I hadn’t but was super intrigued by it when I came across it on a recent grocery trip. After seeing it, I was thinking about what I could do with it all day and when inspiration for a dinner idea struck I knew it had to happen. But being the food blogger that I am, I wanted to make my own version and add bacon. Because, well, we know it makes all things in life better. It’s just a fact. So back to the store I went for some giant red onions. I already had the bacon because I am a good person who loves her family. 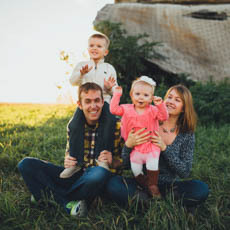 Although the process is pretty simple, it is time consuming so make sure you plan ahead. The onions take a bit of time to chop into a small dice then you cook them down for about 20 minutes in the bacon fat after the bacon has been crisped. Then the sugar has to caramelize in the bacon onion goodness. All together it takes about 45 minutes from start to finish but it’s so worth the time and effort. The final product results in a sweet, smoky thick jam with a bit of a zip from the vinegar used to balance it out. Speaking of the vinegar. I chose to use a combination of red wine vinegar and balsamic vinegar since Joel doesn’t love balsamic. You can use both like I did or use one or the other. If you use all balsamic, the vinegar taste will be stronger but still delicious if you enjoy that variety of vinegar. It would even work with white vinegar if that’s all you have on hand but it would lack a bit in depth. I love the zippiness of vinegar so I pretty much have every variety known to man but I also know that’s not normal. If you don’t want a million different vinegars filling your pantry, use what you have, taste and adjust. Or leave a comment below and I’ll try to steer you in the right direction. I’m definitely more of a savory person than sweet so this jam totally speaks to me. It would be spectacular on your morning toast or eggs. Sandwiched between your grilled cheese. Spread atop brie before wrapping it in phyllo and baking it. Or stay tuned for Monday when I share what has become our new favorite dinner and will definitely be our new spring and summer go-to for barbeques. Don’t miss it guys. Heat a large skillet over medium heat. Add bacon and cook until crisp. You need 3 tablespoons of fat in the pan. If there is not enough bacon grease, add olive oil until the required amount is reached. Add onions and cook for 5 minutes, stirring occasionally. Add the salt and pepper and cook another 15 minutes, stirring occasionally. Reduce temperature to low. Sprinkle the sugar in a thin layer over the bacon onion mixture and let it melt without stirring, 4 to 5 minutes. Once melted, increase the temperature to medium-high and cook, again without stirring, until an amber caramel forms, 3 to 5 minutes. Watch it closely so it doesn't burn. Once caramelized, stir in the red wine and balsamic vinegars. Cook another 5 minutes, stirring often, until a jam consistency is reached. Remove from heat and allow to cool for 10 minutes. Place in airtight jars and refrigerate until ready to use for up to a week.